In October 2012 a new transit law was passed in Costa Rica, which is more specific about road matters. 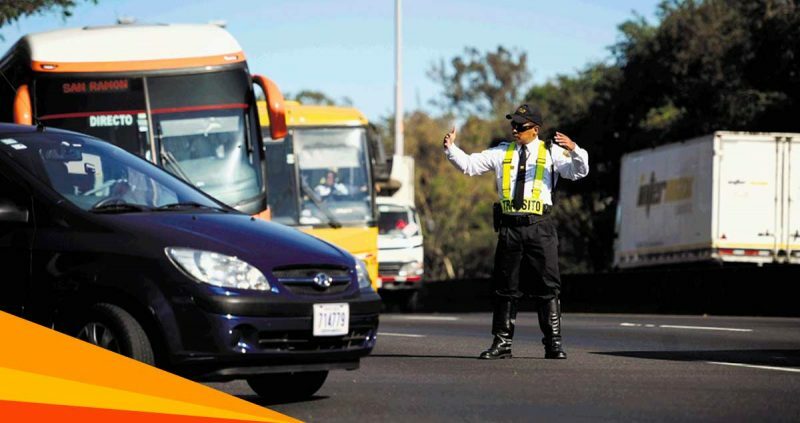 It is necessary to know the traffic regulations in order to have a pleasant driving experience in Costa Rica. The agency responsible for ensuring compliance with the law and assisting the driver is the Transit Police. Officers can be identified by their white and black uniform with a badge, which must have their name. Importantly, the police of the municipalities also have traffic police powers. Travelers who have a driver’s license, who are in the country as tourists or in transit, are authorized to drive in Costa Rica in the same type of vehicle authorized on your license for a period of three months, after that time is necessary to obtain a local license. When parking you must be careful in Costa Rica, because roads have parking meters which are used to control and charge the cost of the temporary parking of a vehicle on public roads. When driving in Costa Rica, if you have committed a driving offense you will receive a physical or electronic citation, through which you will be notified of the offense attributed to you. The faults are classified according to severity. In addition to the monetary penalty, there is a point system for the residents of Costa Rica for faults A and B. Like in most countries excessive alcohol consumption and driving, drug use, the “piques” (or illegal racing on public roads), overtaking on bends and abuse of speed above 150 km per hour are considered infractions, and these are faults involve a fine of ¢ 280,000 (560 USD). Running a stop sign or red light, transporting children without special safety devices (child seat), and to pass another vehicle on the right side are type B faults and involve a fine of ¢189,000 (378 USD). Those with less than three years after they have acquired their license to drive in Costa Rica are novice drivers from that moment they acquire that particular driver status. Alcohol levels allowed to drive a vehicle in Costa Rica became more strict with the new laws and depend on the type of driver, if they are newbies or particulars. Alcoholometry tests are done by air drawn, in novice drivers a level greater than 0.50 gr involves a criminal penalti, levels between 0.20 and 0.50 grams lead to fines of ¢ 280,000 (560 USD). In particular drivers a level greater than 0.75 grams involves criminal penalties while levels between 0.50 and 075 grams lead to fines of ¢ 280,000 (560 USD). Consider these recommendations when you use your rental car to drive on our roads … enjoy your trip!